Gentle readers, let me tell you a story. It's a story about cake. 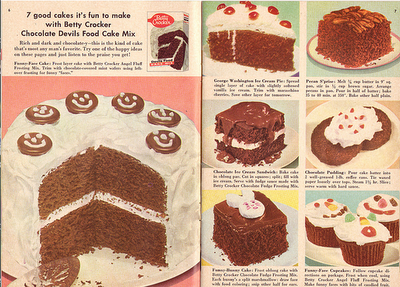 In the latter half of the 1950's, sales of commercial cake mix flatlined. 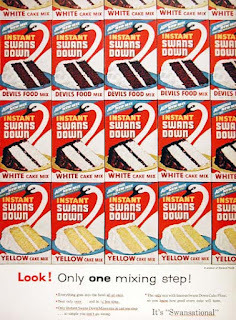 Which was a real stumper for Duncan Hines et al: they'd enjoyed barnstorming sales numbers in the ten years since the first high-quality, shelf-stable mixes went on the national market. "So simple you CAN'T go wrong." After interviewing women and exploring the emotions that surrounded cakes and baking, Dichter reported that the very simplicity of mixes - just add water and stir - made women feel self-indulgent for using them. There wasn't enough work involved. In order to enjoy the emotional rewards of presenting a homemade cake, they had to be persuaded that they had really baked it, and such an illusion was impossible to maintain if they did virtually nothing. The solution? Give the baker more to do. In microcosm, this could be as simple as adding an egg to the mix, transforming the process from menial dump-and-stir to 'real' baking. But in the bigger picture, this idea took off in the form of cake decorating. Marketing emphasis shifted to what the baker would do once the cake came out of the oven: a whole explosion of creative and often labor-intensive cake-crafting how-tos ensued, next to which the 'indulgence' of using a prepackaged mix was nothing. "Try one of the happy ideas on these pages and just listen to the praise you get!" Y'all know where I'm going with this, right? In fiction writing, the idea of "leaving the reader something to do" works on almost every level. It can be as small as saying that John slammed the door, and leaving the reader to understand that he's left the room. It can be as vast as writing a story about some talking farm-animals, and prompting the reader to draw in the real-world politics and human nature behind them. But if you do everything yourself - if you explain and describe like a manic entomologist, if your characters feel all the necessary feelings and reach all the necessary conclusions and wax philosophical about What It All Means - then eventually your reader will get the idea that the story can get along perfectly well without him, and check out. Sure, the whole DIY angle has its downsides. Betty Crocker knows, some fool will use bad eggs or forget to grease the pan or try to frost it while it's still hot, and then get pissed at you when it doesn't turn out right. (And as my patient and forbearing beta readers have taught me, it DOES help if you actually include some directions.) But anytime you feel tempted to idiot-proof your story, hold fast to the sacred tenets of our man Ernest Dichter up there: good fiction, like homemade cake, is about helping the audience enjoy the emotional rewards of their work. And they can only do that if we give them work to do. Did I hear grief counseling? Nice post. The best advice I ever received about my writing was to just tell what happened and let the reader feel the emotion. It was a hard lesson to learn and I still struggle with it. Hahaha, ohh, I do know that pain - dropped my sister's graduation cake right on the floor at the restaurant. "Epic" and "failure" went hand-in-hand there too. You are right, though: knowing the lesson is not even remotely close to knowing how to *execute* the lesson - which is why we have to keep going back to that dang support group, I'm sure! This was a great post. You hooked me in with your metaphor before I ever knew where you were going. Excellent advice shared in a memorable. But now I want cake. Cynthia, that is EXACTLY my same problem. Keep starting with deep thoughts, keep ending up wanting cake. Apologies for inflaming your appetite - glad to know the thesis was worth it!